Disclosure: BestVPN.co is an original user supported website. We may earn commissions, if you buy a VPN through our links learn more. A specialized VPN review site that originated last year out of the vacuum felt in the VPN industry of unbiased user reviews. Based in Lincoln, NE 6850, USA, we are actively engaged in promoting cybersecurity values and the ideals of free internet to everyone. This site is directed to users of all kinds and we don’t discriminate against anyone irrespective of whoever they are. Best VPN websites that label themselves as “Privacy Mentors”, “Security Professionals” and blah blah are really just phony! We at Bestvpn.co, however, take honesty and unbiasedness of VPN reviews very seriously. This website was created from the dire need of a legit and accurate review website that could offer un-biased roundups of Popular VPN services. We never indulge in getting money from providers to rank them at a certain spot or to do a fake review. We offer unbiased reviews and earn commissions if you, the user is convinced enough to go through with the purchase of a vpn subscription plan. But in no way does our affiliate commissions based revenue model influence our reviews or rankings. We don’t do commentary but a subjective analysis of every VPN service provider we tend to review, based on the facts. Leaving no stone unturned, we have published multiple, unbiased studies on a variety of issues from the VPN industry. From assessing the data retention laws of VPN Jurisdictions, analyzing Logging Policies, to conducting Leak Tests, and bypassing VPN blocks via Obfuscation, we go in-depth into all providers to dig out the dirt for you. This has allowed us to manage and build a budding community of hundreds of thousands of regular monthly visitors. Our work is different from other review sites in that we always back our opinions and claims with proper facts, results and details. Never once will you see our own personal opinion being offered on a certain issue without us giving you proper detailing on it. 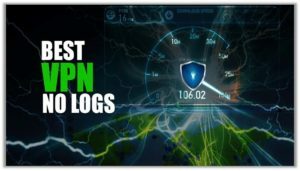 VPN Comparison 2019 – Over 180 Providers Tested! How We Pick VPNs for Reviewing? Why Should you buy a VPN product? How We Pick Best VPNs for Reviewing – Rating Criteria for Testing! Our highly thorough and comprehensive review format includes assessing a VPN software from every SINGLE ASPECT! We have signed up with a total of 180 providers, taking our complete time in assessing every one of them. This helps us accurately categorize them, according to user needs.Each VPN is tested on multiple platforms like Windows, Mac, Linux, Android, and iOS. We even test routers to get an unbiased overview of their offerings. This allows users to read VPN reviews that holistically tell them about how well an actual service performs. We then usually divide providers according to different performance metrics. 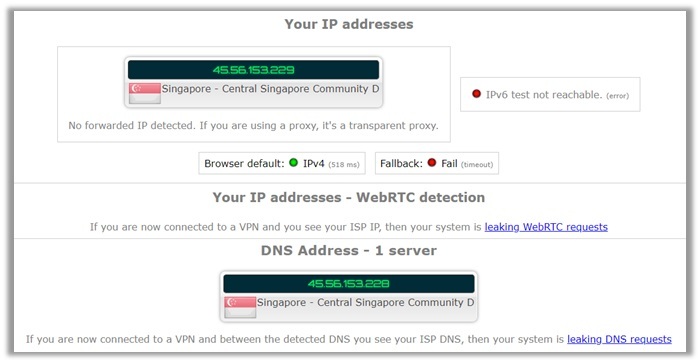 All the VPNs we list for review undergo a speed test, DNS/IPv6 leak test, and tracker test. BestVPN.co might be a relatively new VPN review site. However, the team behind it has an experience of over a decade serving in this industry. We were there before such privacy protection tools started gaining fame in the marketplace. During this time, we have successfully directed a whopping 1 million+ users towards relevant VPNs for unblocking streaming sites, bypassing firewalls, P2P/torrenting, or receiving maximum privacy online. To give users a better idea about different services, we also performed an analysis on over 180 providers in the marketplace. The results we scaled from this ginormous analysis have been highlighted in the table we’ve presented below. 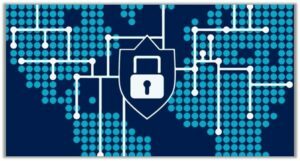 Best VPN For 2019 – Recommended Providers! Surfshark even offers a lot of useful features to customers. For instance, CleanWebTM adds ad-blocking, tracker-blocking and malware protection to your VPN connections, which enhances your overall browsing experience. It even offers an immensely useful MultiHop feature. This can allow you to bypass your internet service through two different servers around the world to keep your identity hidden. Add this to Surfshark’s diamond-strong protection and users can feel assured to stay safe online at all times. For connectivity, the provider does not to disappoint and offers amazing internet speeds on its expanding server list. This number of servers have now stretched to 500+ in 45 countries in just 2 months. The VPN client despite being a new player is also perfect for accessing Netflix content (since you even have dedicated IPs available). If you need any assistance, the 24/7 live chat support team proves to be quite helpful and responsive too. You have apps for all internet traffic platforms/devices too, along with a Router app. 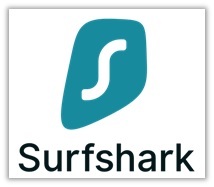 If you want to learn more about Surfshark, check this comprehensive review out! For users who regularly engage in P2P/Torrenting or stream pirated content online, DNS servers leaks are incredibly risky. They could result in you paying hefty DMCA fines. 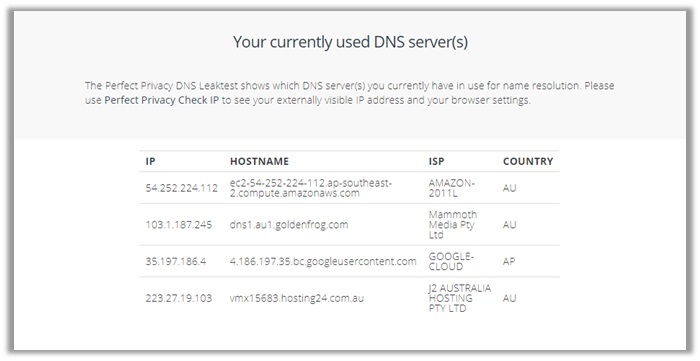 Luckily with Surfshark, you can feel assured that there are no dangers of your DNS service leaking out. The VPN does not reveal your true identity or location. 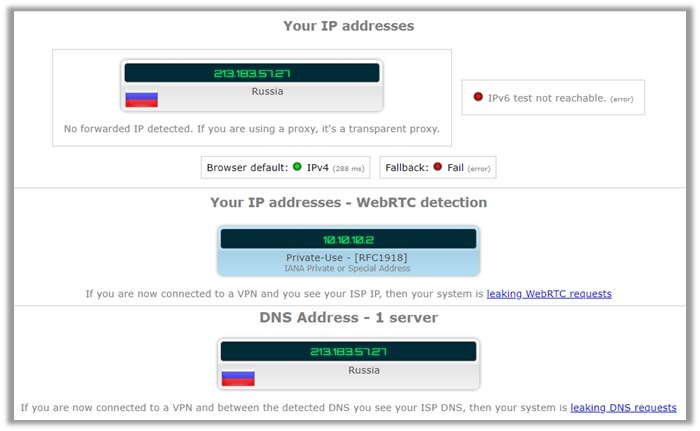 As you can see, the results below reveal that there is only a single DNS server detected from Russia. The 2 year pricing plan costs the users just $3.29/month which totals to a paltry $78.96 (billed once). However, if you want to receive the best value for your money, consider subscribing to their 1-year plan (73% Off). It typically gives users a massive 73% discount, dropping the per month costs to $2.95! The total cost for this plan is just $35 billed once. The best part of all: all plans are backed up by a 31-day refund guarantee. This allows you to test-drive the service and its capabilities. Acceptable payment methods are quite diverse and include options like PayPal, AliPay, Payment Wall, Bitcoin and even Gift Cards. Once you start using the service, you get to leverage fast vpn speeds and strong unblocking, Wifi VPN security features. Users gain access to a huge list of 2000+ servers in 140+ countries and 180 locations worldwide, multiple security protocols (PPTP, L2TP, SSTP, IKEv2, OpenVPN & the revolutionary Stealth protocol), and simultaneous connections on more than five devices at the same time. In addition to this, PureVPN even goes the extra mile in protecting user data collection by offering IPV6 and DNS Leakage. However, things do not just end here, as the quality VPN even offers plenty of advanced features. These include NAT Firewall for preventing malicious attempts on your network. Split Tunneling and SOCKS5 proxy for improved performance to download torrents and stream content online. Ad/Tracker blocking features to hide away those irritating adverts when browsing the internet. Below we conducted a WebRTC Test from Browser Leaks on the provider. The process involved connecting to a server in the UK. 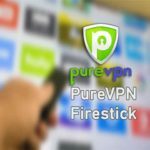 PureVPN managed to cloak your identity quite successfully! As you can see, there are no signs of any leakages in the test. 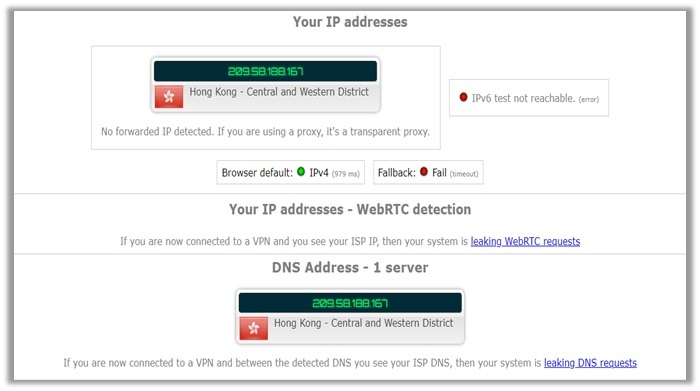 The VPN successfully manages to hide your local IP address and IPv6 address, revealing only the public IP address, which is that of a Vpn location. To ensure that the results we received for both WebRTC and DNS leak tests were accurate, we decided to conduct a complete privacy analysis. We used the famous IPLeak.net for the process. Fortunately, there were no gaps found in this test too. 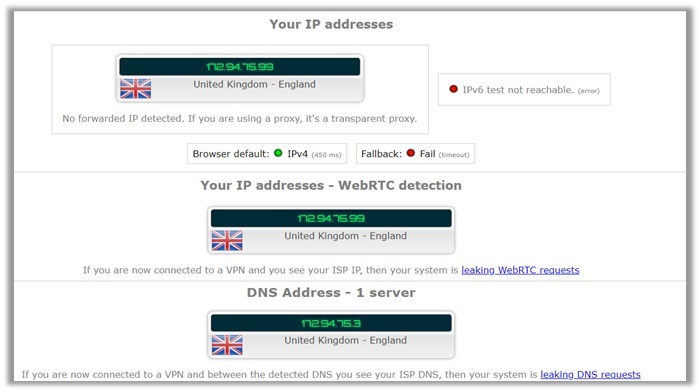 The default IPv4 address is of a UK location. Even the DNS address gives no indications to our original location. This indicates strong customer privacy and anonymity! When it comes to selecting the VPN apps, you need to be 100% sure you are making the right decision. This is why you must look for a neutral third party audit review of providers. This gives prospects an independent assessment of the VPN and its ongoing maintenance of supporting technology. It also provides unbiased information about the services’ standards, guidelines, and CLAIMS! This resulted in a direct call for logs from ExpressVPN. However, the provider denied having any and reiterated its NO LOGS policy. They even received an official testimonial, which further confirms that the event was true. This means, ExpressVPN indeed is a great choice for leveraging anonymity online. The monthly pricing starts at $12.95 and the 6 monthly plan will cost you $9.99/month ($59.95 billed once). But now, ExpressVPN is offering a special 12 + 3 months plan at just $6.67/month! The total cost of this plan is $99.95 billed once, allowing you to save a whopping 49%! Once you sign up with ExpressVPN, you gain access to 2000+ 140 servers in over 90 countries. 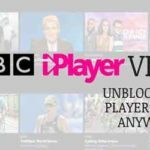 This provides you with unblocking capabilities for geo-restricted websites like Netflix, Hulu, and BBC iPlayer. You even receive 256-bit AES encryption, and dedicated apps for Windows, Mac, iOS, and Android. 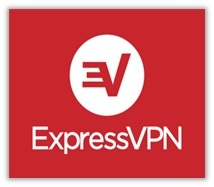 Check this expressvpn review out for a more detailed analysis! The last thing anybody needs is connecting to a VPN server only to learn that their DNS address is leaking. This can prove detrimental. 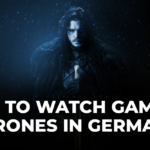 Especially, if you live in a country with tough internet activities and copyright infringement laws. Lucky for you, ExpressVPN offers the latest in VPN protocols, coupled with strong encryption and privacy features. The VPN indicate no leakages at all. 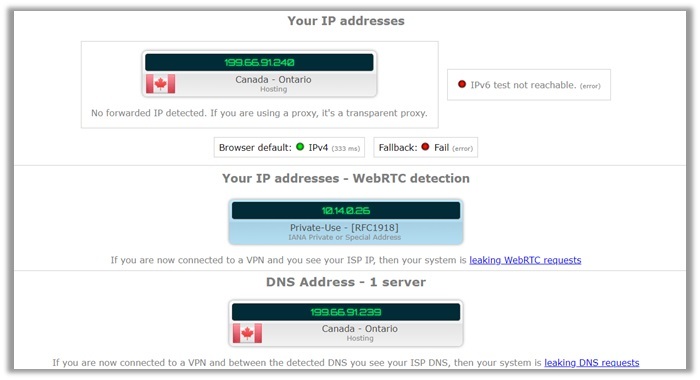 As you can see, the results below show a Canadian DNS address. Reviewing NordVPN took quite a few hours off, and we almost finished all our coffee and smokes. We came to the conclusion that the provider is the best vpn for china and expats visiting the chinese territory. A Creation of the Tefincom co S.A. – NordVPN is a Panamanian-based provider of internet security and privacy services. It offers some of the most advanced technologies and features, leading to its massive growth in the marketplace. Features you gain access to include DNS Leak Protection, Automatic Kill Switch, and Onion Over VPN. For advanced technologies, you have DoubleVPN, which passes all internet/network traffic through two servers located in different countries. 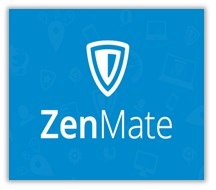 CyberSec that blocks cyber threats, harmful websites, and malware from spreading on your devices. SmartPlay that allows for instant and seamless streaming! 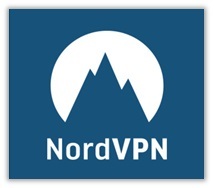 Since NordVPN is a leader in the VPN market, the Trial gives a serious blow to all its customers. Allegations indicate that Tesonet – a data mining firm – is behind the creation of NordVPN. In light of this, the provider understands that they have to gain the trust of their customers back. Therefore, just yesterday they announced that they would be hiring one of the largest professional service firms. Refund can take up to 30 Days! The testing/analyzing process for CyberGhost vpn took us a good one and a half days. This made us realize the provider is a great choice for unblocking websites! 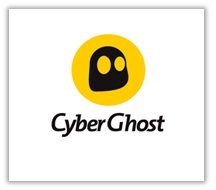 Based in Romania, CyberGhost VPN offers great diversity to its user base. It recently introduced the new CyberGhost 6-user interface on its Mac and Windows dedicated apps. This grants for better user-friendliness, which works in favor of the provider. Read more about the provider in this CyberGhost Review! 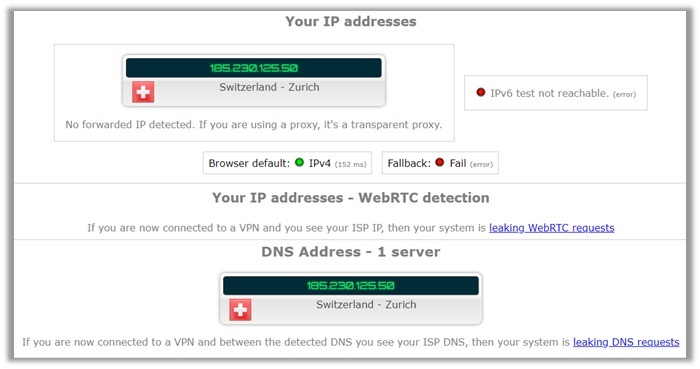 It is always good to get a second opinion about whatever test you perform on VPN providers. Now, you can opt to do it manually, but then why would sites likes IPLeak.net come in handy. If you look at the results below, you can see – there are no signs of any leakage from any aspect. The IP address is that of a German location, including the local IP. The DNS server too is the same as the cloaked IP, which means that there are no leaks whatsoever! After putting in around 24 hours to review TorGuard, we learned it is an exceptional choice for users wanting secure and fast static IPs. The provider is based in the US, so it may turn off potential customers. This is because in circumstances of government investigations and search warrants, TorGuard will comply and provide assistance. However, since the VPN adopts a no connection logs policy, the only information agencies will be able to access is your billing information. If you sign up with Bitcoin, you can mitigate that risk too and receive maximum anonymity online. So, users can feel assured that when they sign up with TorGuard, they get good privacy online and stay protected. TorGuard offers fours different subscription options to users: anonymous proxy, anonymous VPN, anonymous Email, and the privacy bundle. The pricing goes as $5.95, $9.99, $6.95, and $11.54 respectively. To receive the best value, we advise users to opt for the anonymous VPN package. It offers a huge list of features and specifications. Best part of all: the package can be purchased in a multitude of billing cycles with the added incentive of special discounts. For instance, if you opt for the two-year plan, you only pay $99.99. This gives you a massive 50% off on the monthly pricing. Once signed up, you get access to TorGuard Stealth Proxy, 3000+ Servers in 50+ countries, and OpenConnect SSL based VPN. Users can even use Port Forwarding/Selection, not available with different providers in recent times. We even tested the provider for IP, DNS, and WebRTC leaks too, but found nothing that could lead back to our identity. However, the most impressive trait out of all is TorGuard’s huge list of dedicated IPs, which are divided into two categories: regular and streaming. A regular static IP is a good choice for browsing or engaging in online banking. For entertainment-geeks, the streaming IPs are best-suited. All the static IPs locations are priced at $7.99. TorGuard offers users maximum anonymity via strong military-grade AES-256-CBC encryption and availability of a huge list of protocols. These include PPTP, L2TP/IPSec, SSTP, IKEv2, and OpenVPN. Other less famous options include ShadowSocks, Stunnel, SSH tunneling, OpenConnect/AnyConnect, SSL Proxy. Competitors do not support even half of these protocols. Giving TorGuard quite an edge in the marketplace. In terms of connectivity, users have access 3000+ Servers in 50+ Countries. For multiple connections, TorGuard can support up to 5 devices concurrently. To get a better idea about the anonymity offered by TorGuard, we conducted a WebRTC Leak Test. Similar to the above providers, TorGuard managed to successfully keep our identity private, after connecting to a server in the Netherlands. You can see the results in the Browser Leaks test below. To gain a complete picture about the privacy offered by TorGuard, we conducted a complete privacy analysis from IPLeak.net. We connected to a server in the Netherlands from the US. As you can see from the results below, our identity and original US IP address is invisible. This means, users can feel assured to stay secure online with TorGuard. Reviewing PIA took us a good 36 hours. Our synopsis about the provider is that it is a great option for streamers and individuals, who want a good VPN for unblocking geo-restricted websites. The provider is located in the US (part of the Five and Fourteen Eyes Alliances), so its credibility is poor in the marketplace. However, the VPN has never been caught revealing data. As such, users can feel assured that their identity remains safe with PIA. Add this to their exceptional military-grade encryption of AES-256, with SHA256 for data authentication, and RSA-4096 for handshake and the provider is definitely worth the money. For connectivity, PIA offers users an expansive database of 3272 servers spread across 25 countries worldwide. PIA strikes the perfect balance between affordability and value. It offers some of the best packages in the marketplace of VPNs. The monthly pricing begins at $6.95, but longer durations grant you access to special discounts. For instance, if you sign up for their yearly package, you will only have to pay $3.33/month – giving you an awesome 52% discount. This totals to $39.96 yearly, which is quite budget-friendly to say the least. However, if you want to receive the best value, we advise users to go for the 2-year subscription. This plan further reduces the monthly costs to $2.91, meaning you only pay $69.84 for two years. All plans are backed up with a 7-day money back guarantee. When you sign up with PIA, you gain access to very useful features. MACE, for instance, is a new system offered by the service. 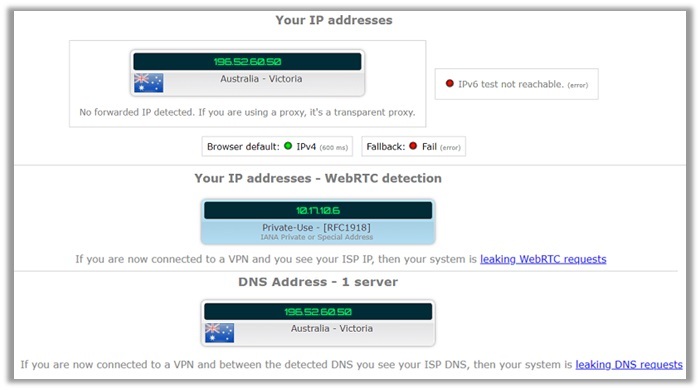 It returns IP addresses of unwanted domain names, blocking irritating ads, saving you data and bandwidth. The provider even supports SOCKS5 proxies. 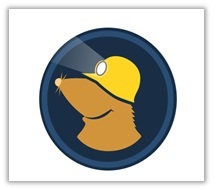 This helps users receive maximum security and anonymity for their P2P/Torrenting activities. Other features include ad/tracker/malware blocker, dedicated apps for all famous devices, and ability to connect to 5 devices simultaneously. The provider even offers its own DD-WRT Flash Routers. You can check them out here. This enables users to utilize the VPN connection even on gaming devices like Xbox, PS4, and smart devices like Apple TVs. PIA has proved itself as a reliable service – thanks to its no logging policies, which have been verified during an FBI case. However, does the VPN remain consistent in offering complete anonymity online? Yes, it does! You can see the results below, which reveal zero information about our connection to an Australian server from the US. 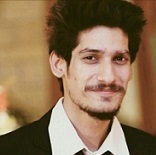 To gain an unbiased opinion about the anonymity of PIA, we decided to perform a test on IPLeak.net. We connected to a server in Victoria, Australia from our US location. According to the results, there was no information about our original IP address. 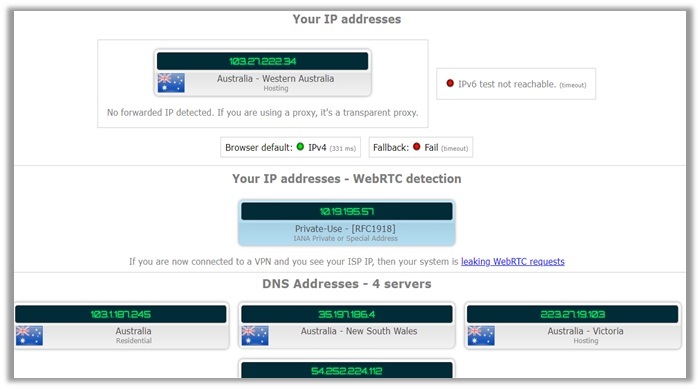 The IPv4, WebRTC, and DNS all indicate that you are based in Australia, guaranteeing utmost level of anonymity. 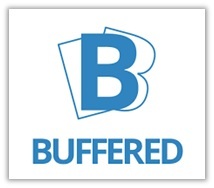 You can get started on using Buffered by signing up for their premium vpn plans. If you want to use a VPN for a short time, go for the monthly subscription, starting at $12.99. For users who need the VPN for a fixed bi-annual period, go for the 6-months plan. It is billed at $59.9, allowing you to leverage a 23% discount. However, if you are looking for the best, go for the 13-Month Special! Live chat support is amazing and incredibly responsive. You even have features like: Firewall based Kill switch, Port Discovery, and Auto Connect. It does not matter if a VPN offers strict no logging policies. If it exists outside every major surveillance alliance, or offers lightening download speeds. The minute it leaks your IP, everything goes to the garbage, as your private identity comes forward. Buffered VPN, despite being new, follows through on all its promises. The DNS leak test did not reveal our true location. As you can see, there is no indication of your US location. 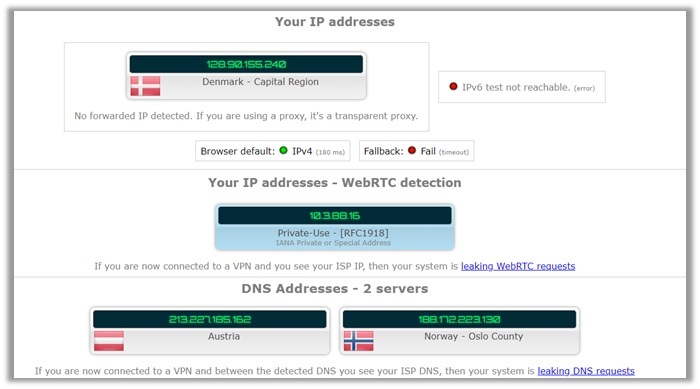 There are only details about an IP address from Denmark. The DNS address also shows two locations: one from Austria and another from Norway. However, there is still no information about our local IP from within the US! The Chameleon technology is tailored for offering maximum protection on OpenVPN protocol. It scrambles the packet metadata, maximizing your anonymity online, especially from Deep Packet Inspection (DPI) attacks. The feature even resolves issues with bandwidth throttling. This makes it a good option for those who enjoy gaming. 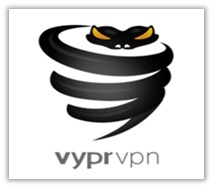 For more information, read this in-depth VyprVPN review! If that were not enough, Mullvad offers dedicated clients for all platforms and support Windows, Mac OS, Linux. Features include DNS Leak Protection, Teredo Leak Protection, and 4096 bit RSA certificates (with SHA512) for server authentication! The best part of all: you get all these privacy features for only €5/month! The provider accepts Swish, PayPal, Credit Cards, Bank Wire, Bitcoin, and Bitcoin Cash – in case you want to sign up. For more information about the provider, read this in-depth Mullvad review! 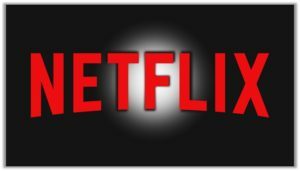 Undoubtedly, Netflix exists as one of the most popular streaming platforms online, which offers a huge selection of movies/TV shows, along with the broadcaster’s originals. However, since the website imposes geo-restrictions i.e. 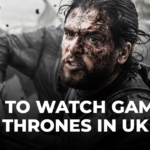 Netflix Ban, only people in the US, Canada, UK, and selected countries can access content. Nevertheless, regional restrictions are now a thing of the past. You can simply use a VPN to bypass geo-limitations. Simply connect to a server in the US and enjoy watching your favorite content. Refer to the list below for the best VPNs for Netflix. Keeping user activity logs is a clear invasion of user privacy by a VPN service. Logs, basically put, are records of different kinds of metrics pertaining to user activity online. These can range from websites visited, usage hours, and connection timestamps among others. Created by XBMC, the Kodi open-source, multi-platform app is the ultimate choice for entertainment. 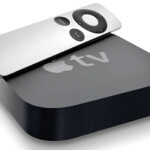 The software transforms any smartphone, tablet, laptop, or PC into a TV box, which streams high-quality movies/TV shows. It uses official and third-party add-ons to deliver content from various resources. However, since streaming pirated content can get users into legal hassles, especially in countries with strict copyright infringement and anti-piracy laws – it is advised to use a VPN service. 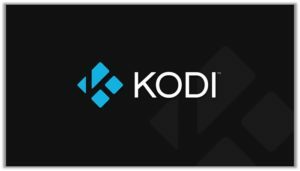 Below is a list of the best VPNs for Kodi, based on reliability, performance, support, features, and server availability. The iPhone created by Apple is famed worldwide for being a highly stable and secure smartphone. 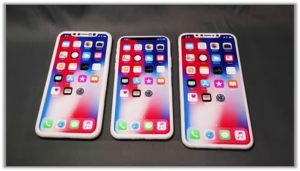 However, this does not mean that iOS does not have its own issues of privacy and security, especially in today’s climate of security breaches and hacking. This is why it is crucial to use a VPN service to ensure you retain your digital privacy and identity, while exploring the internet online. This also helps in circumventing censorship and accessing geo-restricted content, while avoiding legal hassles. If you have not heard of the term “Ethical Hackers”, you might be a little confused, considering this to be an oxymoron. After all, everyone invests in a VPN solution to protect their identity from cybersecurity criminals. However, just like you, even hackers need their privacy. 20 years ago, banking was an in-person experience, which required individuals to make visit to the physical location and wait in life for chatting with support or making a deposit. With the introduction of web technologies, soon enough things started shifting to the online world. 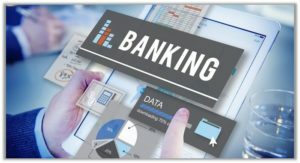 This has of course raised plentiful of security concerns for which banks deploy a number of user data protection measures to keep your information private and completely secure. However, there is still a high risk of getting robbed, especially if the users themselves are not proactive. When it comes to manually setting up a VPN on Windows, you have two choices: PPTP or OpenVPN. The latter requires the installation of the OpenVPN GUI for loading configuration files, which is quite simple. However, most users struggle with PPTP. So, follow the steps below to ease the process! Enjoy using the VPN on your Windows PC! 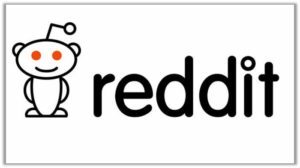 Since our vpn guide assesses customer opinions & experiences, it is only reasonable to check what users are saying about the best VPN Reddit providers. In light of this, we researched through countless Reddit threads/sub-reddits to determine the best VPNs for reddit along with what user generated Best VPN reviews can we source from this great platform. If you need to find a VPN for a specific purpose, you can also consider following this Reddit Thread. Here you can share your needs and a fellow Redditor will provide suitable recommendations for VPNs. Abbreviated as “VPN”, a virtual private network is a technology used for creating a safe and encrypted connection on private/public networks. It typically establishes a secure gateway for users to access apps and websites online. VPNs also encrypt all data sent and received through their networks. This ensures that local ISPs and copyright trolls cannot trace your identity. To secure the internet connection, the best VPN will use authentication methods, which include PINs, tokens, and passwords. Large corporations, government agencies, and educational institutions use VPNs to grant remote users safe access to enterprise applications and other corporate resources. In simple words, VPNs are not very different from firewalls that protect your data on laptops/computers. The only difference is; these private networks offer security for information shared “online” via a combination of encryption protocols and dedicated connections. To achieve this, you even leverage advanced features like Kill Switch, Ad-blocking, Split Tunneling, IPv6 Protection, and DNS Leak Protection. China, Iran, and North Korea are a few countries that have interfered and banned access to social networking platforms like Facebook, Twitter, or YouTube. Users in these countries can use VPNs to regain access to their social media profiles and communicate with their friends and family members. Simply shift your location to another country! Which Free VPN is the Best? We performed a thorough analysis on 180 providers that include freemium VPN services. According to our analysis, TunnelBear, Windscribe, and Speedify are among the Best Free VPN services. These Free services have strict data limitations but they can provide you with much needed online security. However, if you want to engage in Torrenting or streaming, you will have to invest in a premium solution. That’s because Free VPNs don’t offer such premium features or facilities. Which is the Best VPN Service in the Market? Declaring a Winner in the VPN category is an incredibly hard task. This is because different VPNs have varied strengths and weaknesses. Where some may offer better compatibility for streaming/unblocking, others may be better for P2P/Torrenting or leveraging maximum anonymity online. What we are trying to say basically is that when discussing VPNs, “BEST” is subjective. Its rather more suitable to group the Top services in each category and then offer them to users to choose on their own. Its exactly what we’ve done during the course of the whole guide. What is the Best VPN to Use in UAE? Currently, there are several “working” VPNs that operate smoothly and securely in UAE, each from varying locations and backgrounds. We usually recommend using Top VPNs like Express VPN and NordVPN for usage in restricted locations like UAE and China. This is because they offer Stealth and Obfuscated servers respectively. These special servers are optimized for bypassing geo-restrictions and censorship in countries, with tough internet laws. However, if you are looking for more options, do check out Surfshark, BulletVPN, and VyprVPN. Check out our detailed video guide that covers the most important aspect of a VPN and information that is important before buying a VPN Service. This video is for all the user who gave feedback about the text being too long. So enjoy the video and don’t forget to LIKE, SHARE and SUBSCRIBE!